We invite you to stay in our comfortably and tastefully decorated 1840 four-bedroom farmhouse and cozy country cottage nestled in the middle of 83 acres of rolling Pennsylvania countryside. The Pennsylvania farmhouse is a simple log frame structure with white German siding with two front doors, typical architecture for the mid-1800's. The cottage has a large central stone fireplace (currently not functional) and was used as a smokehouse and summer kitchen in the late 19th & early 20th centuries. 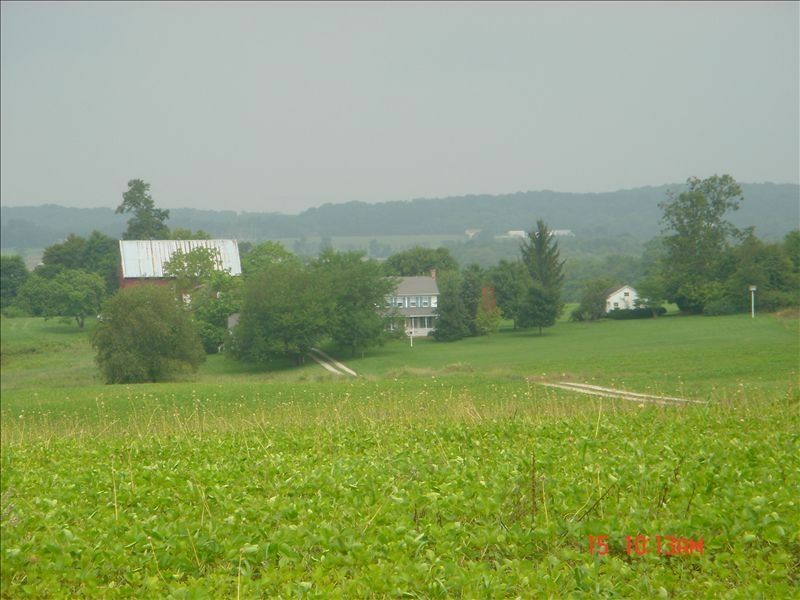 Situated in beautiful Adams County, we are located approximately two miles from the historic colonial town of East Berlin, PA (population: 1,400), founded by Pennsylvania Germans in 1764 and placed on the National Register of Historic Places in 1985. Property Description and Location: The property has a beautiful in-ground pool, Pennsylvania bank barn, 3-car garage, lovely views, and privacy and is an excellent base for relaxation and exploration of nearby Gettysburg, Lancaster's PA Dutch Country, Hershey, Baltimore, Philadelphia, Washington DC, and New York. World-wide travelers will find many French and European touches. We also have lots of original art and handmade pottery in both the farmhouse and cottage. Historical: Our farmhouse has two plaques indicating registration as a Civil War building (having been built prior to the Civil War of 1863) and has received recognition from Historic Gettysburg-Adams County, Inc. as a home restored to its original 1840's era. Farmhouse (sleeps up to 8): There are four bedrooms on the second floor of the farmhouse: three with a double bed and one with two single beds. All are furnished with antique dressers, desks, and lovely bed linens. Cottage (sleeps 2-4): There is one loft-style bedroom with double bed on the second floor and a comfortable pull-out double sofa bed in the living room. In addition, we also have a Writer's Studio with two single beds, which can be used, if needed, at a cost of $80/night. There is no bathroom in the Writer's Studio, but it is just steps away from the farmhouse. We charge a one-time cleaning fee of $175.00. We will consider pets with prior authorization and charge a one-time pet fee of $75/pet. We allow small weddings of about 100-125 guests between May and September when the pool is open. The fee is $1000/day for use of the farm and pool. If overnight accommodations are used, there will be a reduced rate of $495/night instead of $595/night. No minimum number of nights required. We will be glad to give recommendations for tent rental, caterers, photographers, etc. Also, October through April we will allow rentals for small gatherings, family dinners, etc. for 5-20 people for $500/day, plus cleaning fee of $100. The farmhouse has a full bath with tub and shower on the second floor and a powder room on the first floor. The cottage has a full bath on the first floor with shower. Views of rolling fields of corn, milo, and soybeans surround the farmhouse and cottage which sit in the middle of 83 acres. Local calls only. Cell phones work very well at our farm. Window air conditioners in Farmhouse, Cottage, and Writer's Studio. (2) Refrigerator in both farmhouse and cottage. Also a mini-fridge in the bath house. We have a brand new ceramic cook-top stove with oven. (2) Microwave in both farmhouse and cottage. (2) Full Kitchen in both farmhouse and cottage. We have a children's highchair if needed. Direct TV with over 155 channels, including sports channels. Lots of board games and puzzles, coloring books and crayons for children. Second floor old-fashioned balcony off the master bedroom of the farmhouse overlooking lane, cottage, and property. Five bicycles for your use. Lovely deck at the pool with umbrella table and lots of chairs. Families love our property. This was our summer home for over 15 years and we invite you to stay here with your family and friends and create wonderful memories together just as we did with our children ( who are now ages 31-37!) Also, please note that we have free WiFi in the farmhouse! :) We allow pets with prior written authorization and charge a one-time pet fee of $75/pet. This was a wonderful property to stay at. We had 13 family members from age 1-70 and it worked for everyone. The pool is wonderful - plenty of seating and it is completely fenced in. The farmhouse, cottage and writer's studio were all nice. Barbra was wonderful. She was very responsive and made sure we had a great stay. We would definitely recommend this property and would stay here again. We traveled to eastern PA unexpectedly over Thanksgiving for a family funeral. The host was very gracious to make sure the house was clean and equipped for our large group on short notice. Having raised our kids on a farm, it was like going home - very comforting! The house has comfortable and adequate seating for many guests, interesting antiques, French provincial touches and beautiful art on all the walls. The beds were super comfortable - so important, but often not the case in a rental. The kitchen had everything we needed to cook a full Thanksgiving meal and the dining room was very enchanting. With beautiful weather, we enjoyed walking the grounds and imagined swimming in the large pool. Overall, we felt like we received a bit of magic in a trying time! Most beautiful setting for my daughter's wedding weekend! This wonderful home was the most perfect setting for my daughter's wedding weekend. We felt right at home from day one. It reminded us of my in-laws stone farmhouse property. The entire farm was so tastefully decorated and peaceful. We were able to concentrate on the wedding preparations in a home setting. Our beloved dogs were able to be with us which is a must! There was plenty of room for the family to spread out and relax as well as room for the girls getting ready for the wedding on the big day! I can't say enough kind words for Barbara Eisenhart and her family for sharing their home with us. It is a treasure and we are so grateful we could be there. The weekend went by so quickly that we were sad to leave. We may have to come back next year just so we can enjoy more time at the property. Even the weather cooperated. It was a beautiful backdrop for photos. We couldn't have asked for anything more. What a beautiful place to stay as we celebrated our son's wedding!! The farm had everything you could need to have a comfortable, fun stay! The pool and grounds were beautifully landscaped! The farm house and buildings were charming. Barbara was helpful and flexible with our schedule. We will definitely be back! Barabara is very professional and a great communicator. My family and I had a great time at the farm. The pool was the highlight for me and my kids. Rates (in US Dollars ): Personal Currency Assistant™ Cleaning Fee - $175 $250 Refundable Security Deposit. 50% Deposit Required with Reservation. Balance Due 30 Days Prior to Arrival. 6% PA Sales Tax, 5% Adams County Tax will be added. Personal Check, Cashier's Check, or Money Order. Note: Until confirmed, rates are subject to change without notice.